Now that was a funny round. The top two might have told us something we didn’t really want to hear – that there’s a big gap between them and rest – while the bottom two provided a very welcome message that maybe they’re not a bad as we thought they were. 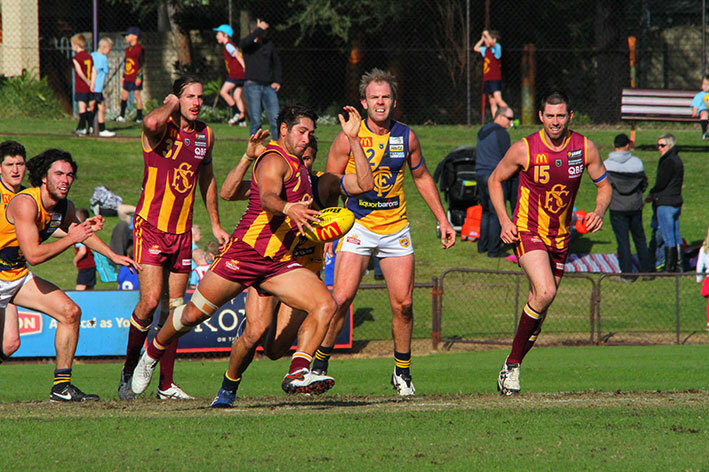 At Leederville, Subiaco looked shaky in the first quarter and trailed Claremont by 23 points at quarter time. I was sitting on the other side of the fence but was able to catch a little of the quarter-time address from Subi coach Jarrod Schofield – a word starting with f was used regularly and with some venom and I also think I heard him say “defensive mechanims”. The Tigers got the first goal of the second quarter and then it seemed the coach’s message sunk in with the Lions and they kicked the next eight. An entertaining contest continued in the second half with the Lions always seeming to be in control. Liam Ryan is entertaining and the small forward had a big influence on the game kicking four goals and setting up others, Adam Cockie was powerful in the midfield and Kyal Horsely and Chris Phelan were also at their best, Ben Sokol kicked three goals and I liked Brett Mahoney’s game too. Ryan Lim was busy for Claremont, Jye Bolton worked extremely hard in the midfield, Jack Bradshaw kicked three goals, Harrison McCracken did some good things in attack and Mitch Andrews was the best ruckman on the ground. Reality struck Thunder down at Rushton Park. Peel had just three Fremantle-listed players in their line-up and one of them, Clancee Pearce, was out injured in the second half. 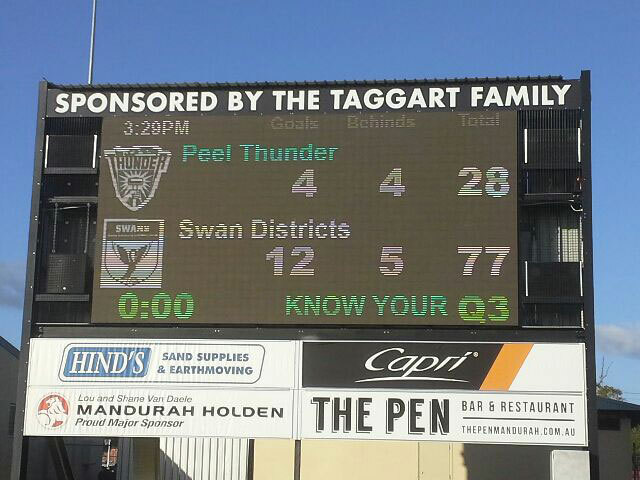 Swan Districts enjoyed the outing and put the game away with an eight-goal second quarter. Ricky Cary kicked six goals for Swans, Adam Faulkner’s usual coal-face game came with some glitter in the form of three goals, Todd Banfield had his best game of the year, Tony Notte was strong in the air and defender Alex Howard again impressed. Andrew Haydon played his best league game for Peel while Blair Bell and Calvin Thorne did some nice things. 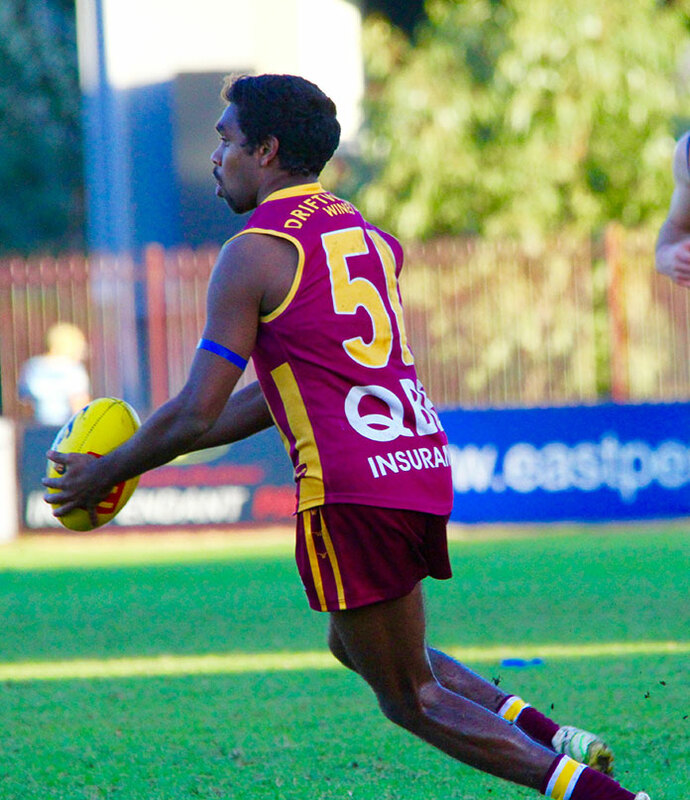 The big upset happened at Lathlain Park where the home team took it up to East Fremantle and maintained their effort. Cody Leggett kicked seven goals for Perth and Brennan Stack got three. The drive came from in-form midfielders Aiden Tropiano, Clint Jones, Julian Jacobs and Liam McKenna. Brock O’Brien kicked four goals and was the best of the Sharks, Brett Peake kicked three and Jamie McNamara had his best game for a while. South Fremantle not only put an end to West Perth’s seven-game winning streak but did it convincingly enough to regain top spot on percentage. It was tight until half time but six goals to none in the third quarter showed the Bulldogs were in control. Ben Saunders kicked six goals for South, Jacob Dragovich played his best game at league level using his pace to advantage, Mason Shaw kicked four goals and Shaun Bewick was outstanding. Dean Munns did his job again, Andrew Strijk kicked four goals and Shane Nelson again won more than his share of the ball. The ladder: South Fremantle 40; Subiaco 40; West Perth 32; East Fremantle 28; Peel 28; East Perth 20; Perth 16; Claremont 12; Swan Districts 8. Next week: Claremont v Perth; West Perth v East Fremantle; South Fremantle v East Perth; Subiaco v Swan Districts.